Children's Book of the Week in The Sunday Times, The Times and The Observer. 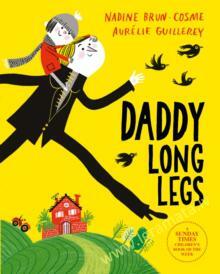 Meet a determined dad with a big imagination in Daddy Long Legs. With its warm, reassuring feel and the adorably drawn relationship between a father and his child, Nadine Brun-Cosme's moving story makes the perfect book for Father's Day and beyond. The car had trouble starting this morning. It gets Matty to nursery, but what if later it won't start at all . . . how will Dad pick him up? Matty is very worried. But Dad soon puts Matty's fears to rest with a series of increasingly imaginative suggestions for alternative modes of transport - from a tractor to a dragon, a polar bear to a rowing boat. But, if all else fails, he'll come on foot . . . because to come and pick up Matty, Dad's legs will never be too tired. Daddy Long Legs is a joyous book with bright, fresh and funny artwork from uniquely talented French illustrator Aurelie Guillerey, full of retro charm.